Mother's Day triggers different memories for different people. Luckily, there's music that speaks to many of these mindsets. As we prepare for Mother’s Day this Sunday, here’s a list of songs that capture the experience of being a mother, love for one’s mother and so much more. Madonna “Little Star” from “Ray of Light” (1998) When musicians write songs about their children, it can sometimes come off as awkward, but “Little Star” is a touching and sweet love letter from Madonna to her daughter Lourdes. Describing her as “a gift of skin and bone” and offering up life advice, this is a tender statement from an artist who wasn’t known for showing a vulnerable side. Sure, “Dear Jessie,” from 1989’s “Like a Prayer” was a playful, child-like, lullaby-ready standout, but the personal nature of this track made it really connect. Alicia Keys (featuring A$AP Rocky) “Blended Family (What You Do For Love)” from “Here” (2016) This is a song for all the devoted stepmothers out there. Keys sings, “I may not really be your mother. / That don’t mean I don’t really love you…/ I think you’re beautiful. / I think you’re perfect.” Borrowing elements from the guitar-riff from Edie Brickell and the New Bohemians’ “What I Am,” this song has real momentum and captures what must be like when you really care for children who have come into your life as a result of marriage. Emotionally and compositionally, this track is Keys working at the top of her game. 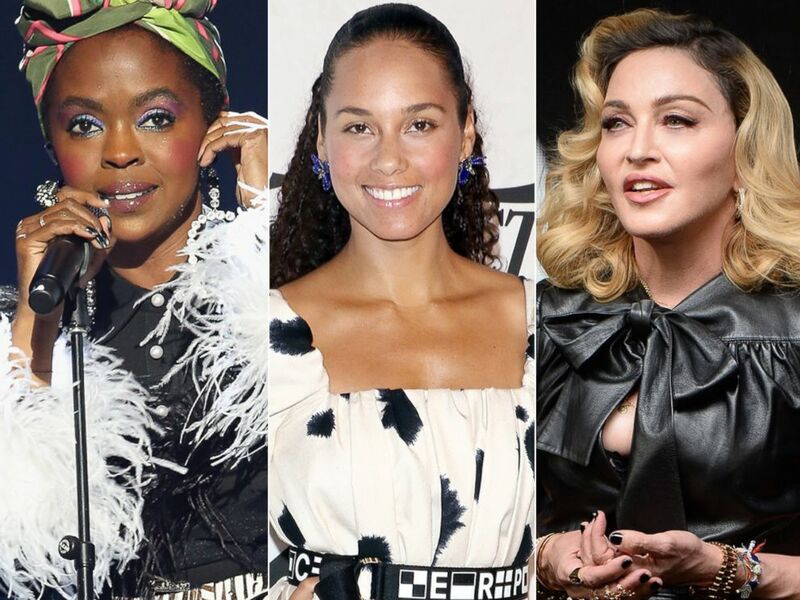 Lauryn Hill at the Rock & Roll Hall of Fame Induction Ceremony, April 14, 2018, in Cleveland, Ohio | Alicia Keys at Cipriani Wall Street, April 13, 2018, in New York City | Madonna at Ludlow House, Sept. 26, 2017, in New York City. The Beatles’ “Let It Be” from “Let It Be" (1970)/ The Beatles’ “Julia” from “The Beatles (The White Album)” (1968) Both Paul McCartney and John Lennon lost their mothers during their teenage years and went on to pay tribute to them later in Beatles songs. McCartney’s tribute is the touching, almost gospel-like title track to “Let It Be,” Lennon’s tribute is the quieter “Julia,” which ends the first half of the self-titled “White Album.” Both songs capture a great sense of longing, loss and love. Liz Phair “Little Digger” from “Liz Phair” (2003) Motherhood has played an interesting part in Liz Phair’s career. On the title track to 1994’s “Whip-Smart,” years before she even had a son, she sang from the point of view of an overprotective mother, singing that she was going to “lock (her) son up in a tower ‘til (she ) write(s) (her) whole life story on the back of his big, brown eyes.” The title of her 1998 album apparently was inspired by a dream she had during her pregnancy with her son. And then, in 2003, she recorded “Little Digger,” which is one of the best songs she has ever written. Post-divorce, it shows the interactions between her young son and her new suitors. “You put your trucks up on the bed next to him. / So he can get a better look at them. / You say, ‘This one’s my favorite one. This one, you can’t have. I got it from my dad.’” This song delivers a real punch, because not only does it show how a child handles divorce but it also shows Phair worrying about the effects on her son, singing, “I’ve done the damage. / The damage is done. / I pray to god that I’m the damaged one. / And all these grown-up complications that you don’t understand. / I hope you can, someday.” It shows the real struggle in being a parent. You hope you are doing the right thing, but there is a sometimes precarious balance. Randy Newman “Mama Told Me Not To Come” from “12 Songs” (1970) On this Randy Newman classic (which was also a hit for Three Dog Night), the protagonist finds himself regretting going to a wild party. He keeps repeating chorus of “Mama told me not to come. / Mama said that ain’t the way to have fun.” The lesson is most definitely to listen to the advice from one’s mother. It can sometimes keep you out of trouble. Jonatha Brooke “Are You Getting This Down” from “My Mother Has 4 Noses” (2014) On her 2014 album “My Mother Has 4 Noses,” singer-songwriter Jonatha Brooke lovingly and tear-jerkingly chronicled her mother’s battle with Alzheimer’s. This also served as the basis for a one-woman show. “Are You Getting This Down?” is apparently a phrase that her mother would repeat to her as her memory got increasingly hazy. This song and this album are both loving statements and testaments of how to get through watching someone you love slowly fade away. Loudon Wainwright III “I Knew Your Mother” from “Haven’t Got the Blues (Yet)” (2014) Leave it to Loudon Wainwright III and his unapologetic wit to come up with lyrics like, “I knew your mother. / Let me be clear. / We were lovers before you got here. / So, don’t forget I knew her when love was the means and you were the end.” This is kind of a silly song, but it is to the point. Parents were once young and playful. They had lives before you. Exploring those lives you can delve into your roots.